Over 1000 years ago, nearly all the ancient wizards were destroyed after the Wizard Wars. However, the one who started the War still remains, having worked his will in secret. If he can find the last Dragonwand, he will regain his powers as the dark dragon. Unaware of the Dragonwand or the betrayer, sixteen-year-old Markus is looking for a wizard who will give him a letter of recommendation for the College of Wizardry. During his journey, he stumbles upon Tolen the Wise, who sends Markus on a quest to end the darkness and find the Dragonwand before it gets into the wrong hands. As Markus discovers growing powers and makes allies, will he find what he needs to complete Tolen’s task, or will the ancient, dark wizard uncover the Dragonwand and forever change the fate of the land of Gallenor? I found Legacy of Dragonwand to be a great start to this series. It's middle-grade/YA appropriate fantasy with wands (of course), magic, evil wizards and a level headed young hero. Markus leaves home shortly before his sixteenth birthday in the hopes of becoming a wizard. After years of dark dreams of fire and dragons, its his destiny. Much to his surprise, he finds much more than he wished for. 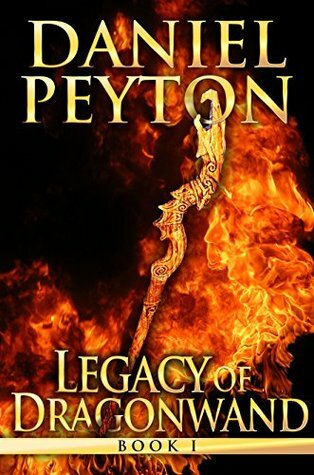 Legacy of Dragonwand thrives with balanced pacing, voice and observations suitable to its teen protagonist. It's a teen's story told as Markus himself would tell it which is much appreciated. Too many times I've read middle-grade/YA books that come off as the interference of a meddling parent. This one doesn't and I found it really let me, as a reader, fit in to Markus' head and his world. I enjoyed the different races and cultures and my favourite place is the Rakki village and library. The imagery made it seem real and inviting and the behaviour details of the Rakki themselves felt appropriate for the species (dogkind) and an effective tool with which to give details of individuals' personalities. The plot has well placed layers. Even characters we know will be trouble are themselves outmaneuvered (whether they know it or not) and the ending of the story is well positioned to move forward. It ends set to rock into the next volume and even though we don't yet (at time of posting) have a soft release date I'm confident Peyton's consistent pacing and storytelling will make it an easy transition in spite of the wait. Legacy of Dragonwand is recommended for all ages.